For comfort, ease of movement and adaptability, hiking in a kilt for the first time can be a revelation. 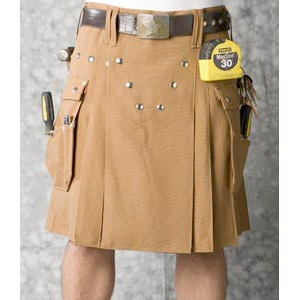 Sport Kilt manufactures a quality lightweight, microfiber hiking kilt that could be worn by men or women. For the price and the workmanship, it's hard to find a better hiking kilt. Well made in the USA, customizable and comfortable. Velcro makes donning a breeze, even in the dark. A little lightweight for colder months, strong breezes could result in a "Full Marilyn"
Sport Kilt of Signal Hill, California, was the result of a group of athletes who were looking for a garment that could be easily be donned after an exhaustive event with no locker room nearby. Taking a nod from surfers in Long Beach who'd wrap a towel around their waist to remove their trunks after surfing, the Sport Kilt (SK) concept quickly gained favor from athletes as an alternative to shorts. Their attention to detail, quality of workmanship and competitive prices lead more traditional kilt wearers to become satisfied customers as well. 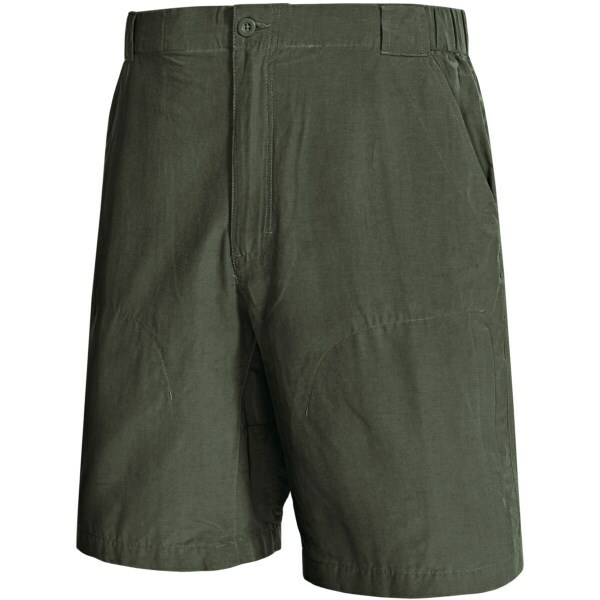 In addition to their more traditional kilts, SK devised a "Hiker" which resembles their Original Kilt but made with a lightweight microfiber that dries quickly, is breathable and adds only a few ounces to a trekker's gear weight. The materia appears to hold up pretty well after repeated washings and wearings. The waist is fitted with an elastic band and velcro closures to make adjustments easy, and donning or removing the garment is done with a few quick moves. Optional buckles can be added to keep the garment more securely closed or to enhance the look of the kilt. It's available in 3 different tartan plaids. It can be sized for men or women as each one is generally made to order at their facility in Signal Hill. Off the rack kilts are easily tailored if necessary. Hiking in a kilt for the first time may be a bit odd for guys who aren't used to wearing unbifurcated garments but once tried, the experience of hiking in a kilt is a revelation of freedom of movement, coolness and comfort. 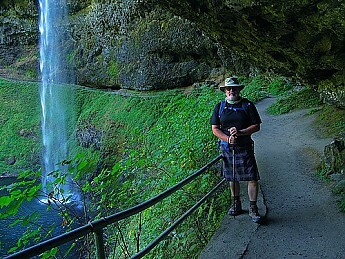 The SK Hiking Kilt is a great option for warm weather and long distant hiking. Side slash pockets are a recommended option but additional cargo pockets are not. SK does make a "Commando" kilt made from a heavier, polyblend fabric in a more military-styling that can be ordered with rear flap cargo-like pockets but I've not tried it for hiking. Because their hiking kilt is made of microfiber fabric, I'd be careful around the campfire as an ember would easily burn a hole into the kilt. I've hiked in my SK Hiking Kilt in the Arizona desert, San Jacinto Mountains, and the mountains in and around Portland, OR. It's served me well but I would not recommend using it for cold weather treks. I should mention that I've tried other kilts for hiking such as the Elkommando by Mountain Hardwear; A quality product, but it needs more pleats to make it more flexible and the sizing was a bit odd for me, and the Utilikilts; a GREAT kilt but heavy as can be as it is made from heavy weight fabrics with a LOT of pleats. I found it a bit warm to wear in the Arizona desert but will give it a try this winter with heavy wool knee socks and boots. A few more companies make a "Casual" or "Modern" kilt that would be suitable for hiking...a quick Google search will result in a handful of helpful hits and good vendors. You're a man among men. Awesome review. If I ever get the courage, I want to try one. Great way to go commando... I need one with my clan colors. When your heritage is Scottish Highlands, what else would I wear!!?? I have been using commando shorts for a few years and they come with pockets so think I'll stick with those . To each their own! The pocket issue is easily overcome from other vendors. The main advantage between shorts and a kilt (for hiking) is comfort. But yep, it is a personal choice. Traditional Scottish kilt styling in material suited for trekking, hiking, and walking. Material dries quickly. Cooler and reduces chaffing. Wear at home or on the trail. Great for men and women. Enjoy wearing my Sport Kilt Hiking Kilt. 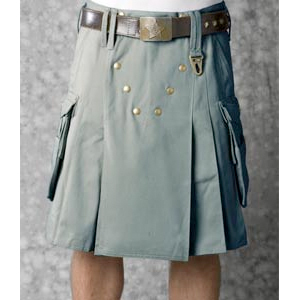 It is a neat design with a wrap with velcro waist, traditional pleated kilt. Size XL with 18" hem weighs 320 g (11.3 oz). Customized mine with pockets, belt loops, and sown in pleats. The pockets easily hold an iPhone 6. Glad it is a skirt design, where I get to choose what NOT to wear underneath. Comfortable to wear all day. Velcro waist patches are large enough to ensure firm closure. Ordered Pacific Blue color, which looks good after several washes. Material seems durable. Sizing is same for men and women, except for length. Ordered standard 22"Sport Kilt hiking kilt, but the 22" length hit me right on the knees. Had it shortened to the women's standard 18" length, and I really like a 16-18 inch length for walking and backpacking. Comfortable with backpack whip belt. Recommend for wear anywhere, on or off trail. It is heavier than my favorite walking skirts/kilts (175 g), but the style is more "acceptable" for men when off the trail. Welcome to Trailspace, GK. 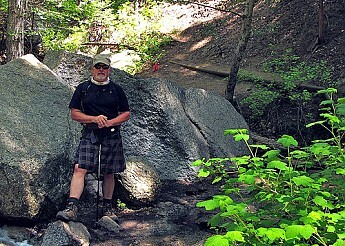 Thanks for sharing your hiking skirt/kilt reviews with us. I'd love to see some pics of your kilt if you're willing to share them in your review. 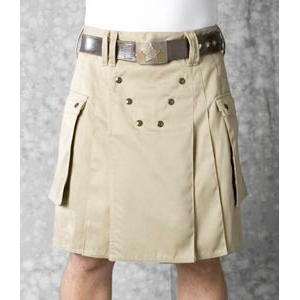 The Sport Kilt Men's Hiking Kilt is not available from the stores we monitor.